The year 2017 was one of anticipation for the freight transportation industry. On one hand, the long buildup to the Dec. 18 federal deadline for broad adoption of electronic logging devices to track hours of service stoked concern that the law would increase pressure on an already challenging market for drivers. That said, there also was a growing sense that the road ahead in 2018 will be better in most respects, with the market for freight hauling showing signs of tightening up as 2017 drew to a close. Topping the list of expectations among trucking executives is faster economic growth but also a new political climate based on pledges from President Donald Trump to reduce taxes, cut back on business regulations and set new terms for international trade. TOP CARTOONS: See gallery of our 10 favorite trucking cartoons of the year. LIVEONWEB: Video discussion of top business and government stories of 2017. YOUR TOP ISSUES: Reader responses to top trucking issues and their impact. Although little progress was seen on the president’s promise to invest $1 trillion over 10 years to rebuild the nation’s roads and bridges, many states acted to increase spending on highways, including Kansas, Idaho, North Carolina, Nevada and Wyoming. In Texas, Gov. Greg Abbott said the state would not set up any more toll roads and called for a study of new ways to fund roadway improvements. With the Trump administration’s arrival came a changing of the guard at several key agencies. Elaine Chao was confirmed as secretary of the U.S. Department of Transportation, and Ray Martinez, a former New Jersey transportation official, was tapped to head the Federal Motor Carrier Safety Administration. The new administrator of the U.S. Environmental Protection Agency, Scott Pruitt, moved quickly to hold up pending greenhouse gas emissions regulations affecting trailers and glider kits. Early in the year, American Trucking Associations reached out to the new president to show support for health insurance reform. In March, Trump sat behind the wheel of the group’s Share The Road image truck and chatted with drivers representing America’s Road Team before convening a meeting in the White House to discuss efforts to repeal and replace the Affordable Care Act. Later, in October, then-ATA Chairman Kevin Burch and executives from several family-owned trucking companies attended a Trump rally in Pennsylvania to promote the president’s tax reform plan. Congressional Republicans on Dec. 13 announced their intention to set the corporate tax rate at 21% as part of their broad parameters of an overhaul of the tax code. Trump expressed support for the rate and called for passage before Dec. 31. Meanwhile, Trump also set new priorities for trade agreements. He pulled the United States out of a proposed Trans-Pacific Partnership and said the United States will withdraw from a United Nations- sponsored international climate agreement. Closer to home, representatives from the United States, Canada and Mexico met in August to begin renegotiating provisions of the North American Free Trade Agreement, which Trump also has criticized. The talks appeared to be stalled, however, over U.S. demands for greater domestic content in cars and trucks produced in Mexico and Canada. At the most recent meeting in Mexico City, in November, the administration proposed adding language that would restrict Mexican trucks from expanding operations in the United States. As for the business of trucking, after many months of mediocre freight volume and weak pricing, capacity disruptions after a series of powerful hurricanes and a surge in holiday shipping seemed to give carriers more leverage to raise rates. That, in turn, has allowed firms to pass along pay increases to drivers and invest more in equipment and technology to make operations more efficient. ATA’s for-hire trucking index surged in October to 147.6, a jump of 9.9% from the same month a year ago. A National Driver Wage Index rose 1.6% in the third quarter of 2017 and is likely to accelerate in the fourth quarter and into 2018, according National Transportation Institute CEO Gordon Klemp. As the deadline for adopting ELDs drew near, FMCSA officials announced plans for a transitory period of soft enforcement in which citations issued between Dec. 18, 2017, and April 1, 2018, would not count against driver safety scores under the Compliance, Safety, Accountability program. Betting on better business conditions, sales of new trucks and trailers picked up in the second half of 2017. Sales of Class 8 trucks in the United States reached 17,928 units in October, a gain of 31.6% compared with the same month a year ago, and the fourth consecutive monthly gain versus 2016. Orders for new vehicles also swelled, and at least one industry analyst, Don Ake of ACT Research Co., said he expects sales to rise 25% in 2018. Trucking company profits mostly were down compared with 2016, while several motor carriers encountered unusual financial turbulence in 2017. Auto hauler Jack Cooper Transport agreed to exchange hundreds of millions of dollars in debt for equity and stave off bankruptcy. Celadon Group and Roadrunner Transportation System replaced their top executives and held up filings with the U.S. Securities and Exchange Commission amid questions about the veracity of earlier financial statements. It was nonetheless an active year for mergers and acquisitions. Knight Transportation and Swift Transportation led the way with their $6 billion deal that closed in September, combining two of the nation’s largest truckload carriers. Belgium-based bpost, a postal operator and parcel carrier, made a splash with its $820 million purchase of e-commerce fulfillment provider Radial Inc.
NFI Industries acquired the nation’s largest intermodal trucking group, California Cartage Co., in an effort to become a more complete provider of transportation and logistics services for shippers. Other notable transactions included Heartland Express’ purchase of truckload carrier Interstate Distributor Co., Hub Group’s buyout of dedicated contract carrier Estenson Logistics and Central Freight Lines’ acquisition of Wilson Trucking, a regional less-than-truckload carrier. Daseke Inc. added specialized munitions and explosives haulers R&R Trucking and The Roadmaster Group; flatbed carriers The Steelman Cos. and Tennessee Steel Haulers & Co.; and commercial glass transporter Moore Freight Service to its flatbed/heavy specialized carrier group. And Canadian company Day & Ross Transportation Group established its first U.S. base of operations for dedicated trucking with the purchase of REI Group and Korten Quality Systems in Romeo, Mich. Both Daseke and truckload/intermodal carrier and logistics services firm Schneider tapped into public equity markets with initial public offerings of stock in 2017. Warren Buffett’s Berkshire Hathaway Inc. struck a deal to buy a minority stake in Pilot Travel Centers LLC, owner of Pilot Flying J, the truck stop chain in which four former executives are standing trial on charges that they systematically cheated customers out of fuel rebates. Private equity firms also made some investments in trucking, with the Carlyle Group acquiring vehicle hauler United Road and Blackstone Group buying a controlling stake in refrigerated warehouse operator Cloverleaf Cold Storage. The growing shortage of truck drivers and technicians remained an industry issue in 2017. At ATA’s annual Management Conference & Exhibition in Orlando, Fla., President Chris Spear announced the formation of a Workforce Development subcommittee to explore what can be done to address the problem. With the national unemployment rate falling to 4.1% in October, ATA Chief Economist Bob Costello issued a new estimate of the number of drivers needed beyond those currently available. He put the number at 50,000 a year but doubling to 100,000 in five years unless something happens to change current trends. Spear also promised more vigorous opposition to state initiatives, such as legislation in Rhode Island that allows the state to collect tolls on trucks and laws in California that mandate meal and rest breaks for interstate drivers. 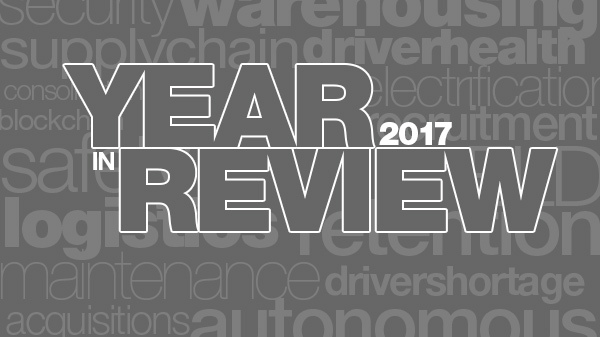 The future of truck equipment also was on display in 2017. The North American Commercial Vehicle Show debuted in October, while Elon Musk unveiled the Tesla Semi, a battery-powered, all-electric Class 8 truck in November. Mack Trucks and Volvo Trucks, both part of Volvo Trucks North America, introduced new models; Volvo in June unveiled its new VNR regional tractor, and followed that in July by showcasing its VNL highway tractor. Mack in September unveiled its new Anthem highway tractor. Navistar International Corp. launched a new HV severe service model while solidifying ties with Germany’s Volkswagen AG. Japan’s Hino Motors disclosed plans to open a truck assembly plant in West Virginia that will produce a new line of Classes 7-8 trucks. Drivetrain supplier Eaton Corp. and diesel engine maker Cummins Inc. announced a plan to jointly produce a new 12-speed automated transmission, while Cummins said separately that it will offer a fully electric powertrain by 2019 and an electric truck by 2020. On the technology front, Uber Technologies launched its first load-matching app, and interest in the use of blockchain technology was reflected in the establishment of the Blockchain in Trucking Alliance. Descartes Systems Group acquired shipment-tracking specialist Macropoint, and Trimble Inc. added 10-4 Systems to its growing portfolio of transportation technology firms. • Dave Manning, president of TCW Inc. in Nashville, Tenn., succeeded Kevin Burch as chairman of American Trucking Associations. • Roland Bolduc of FedEx Corp. won the National Truck Driving Championships. • Carhaulers signed a new five-year labor agreement with the Teamsters union. • CSX Corp. hired veteran rail executive Hunter Harrison as its new CEO and promptly encountered a service meltdown from which it still is recovering. Harrison passed away on Dec. 16.